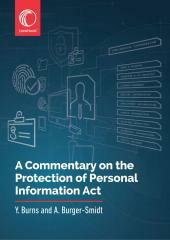 A Commentary on the Protection of Personal Information Act is is a good legal textbook that lawyers and law students will find useful in raising their awareness about data protection which is about to become a big deal in South Africa. Legal practitioners will increase their knowledge on data protection and be in a better position to assist their clients to comply with POPIA by reading this book. Law students will get a good introduction to the topic of data protection and a greater understanding of POPIA by reading this book. BJuris LLD. Former Professor of the School of Law, University of South Africa. BCom LLB (North-West University, MBL (University of South Africa). Member of the International Association of Data Privacy Professionals.